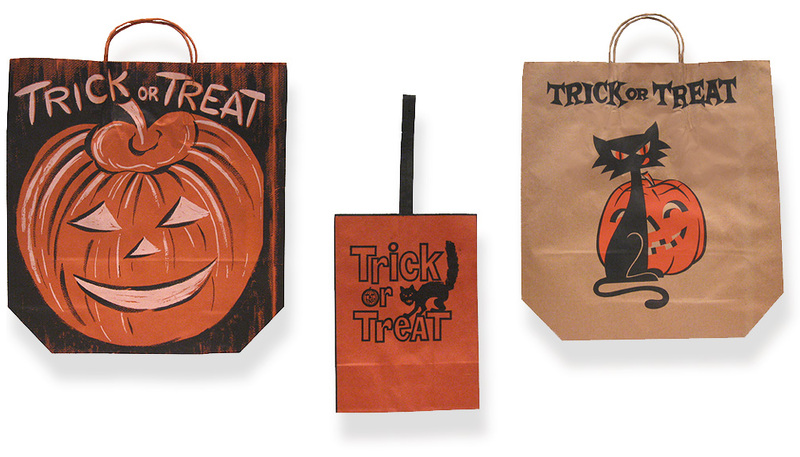 2 Large 20" tall (bottom to top of handle) heavy paper Halloween bags feature Pumpkin and Cat motif in strong graphic designs. Note the whimsical cat that just swallowed something! 16" bag also has a cat / pumpkin motif. All look great as holiday wall decor! Condition is unused, crisp, clean. PLEASE NOTE: WE HAVE ONE SET LEFT. THE PUMPKIN BAG HAS A FEW EXTRA MINOR, SOFT, WRINKLES. Pay on pages safely and securely hosted by PayPal. You can pay with your credit / debit card (Visa, MasterCard, American Express, and Discover) - all without having a PayPal account!